Yep. It’s true. I am not a shoe person. I have a total of maybe 15 pairs in my wardrobe, and they consist purely of boots, sneakers and the odd pair of ballet flats. I have not one single pair of ‘proper’ shoes, no stilettos, no nuffin’. 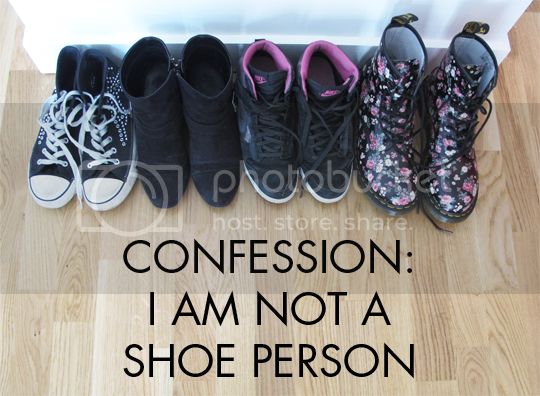 I just don’t really… like shoes. This revelation tends to shock and appall both women and men in my life when they discover it, but what can I say? I’m definitely a function over fashion kinda girl. My whole wardrobe is very samey, actually, with my entire collection of clothes made up exclusively of skater dresses, black tights and sweaters. I just know what I like and stick with it, I suppose. Despite owning about 15 pairs of shoes in total, the above four are the only ones that ever see the light of day. They are circulated day in, day out, according to how much walking I’ll be doing on any given day (it’s usually a lot) or what dress I’m wearing. I don’t feel the need for lots of shoes, I don’t feel I’m missing out. I have everything I need in this teeny weeny little capsule collection. This particular pair are a good few years old now. 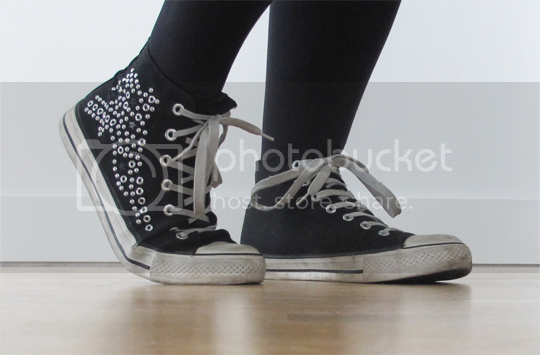 I don’t remember a time in my life where I didn’t have a pair of Converse, or at least a pair of lookalikes. I once had a particularly awesome camo print pair of All Stars that went mysteriously missing between us moving out of the house we shared with Colin’s brother and into our last flat – I miss them. But I do have a lot of love for this pair of New Look knockoffs, mainly due to my penchant for studs on things. See? Studs again. Everyone and their mothers had these boots when they were in store during Summer 2012, me included. I bought a back-up pair as well because I loved them so much and we all know that Primark shoes have a bit of a limited lifespan. Since the original and backup pair, I’ve bought three more pairs from eBay because they do inevitably fall apart with excessive wear but I keep buying more pairs because I just can’t imagine life without them now! So this is pair number five, and I’m currently watching a sixth on eBay. I keep an eye out every couple of weeks for any pairs kicking about in my size so I’ve always got pair in reserve – as you can see, pair number five are looking a bit worse for wear now! I got these from Footlocker last September or so, but I can’t find this exact colour online any more although I have seen them in store recently. Both the Footlocker and JD websites have a good selection though (I’m loving that Queen of Hearts pair on JD!). These are the most comfortable trainers I’ve EVER had, although obviously not the most suitable for actually doing any exercise due to the concealed wedge heel. I like the couple of inches of extra height, but you’d never know from the look or the feel of them on that there’s any heel at all. 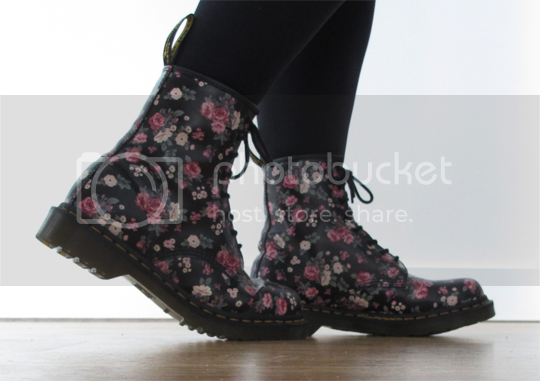 These were a VERY exciting addition to my paltry shoe collection – I had a pair of DMs when I was about 6 years old that were JUST like this except the flowers were yellow. So much nostalgia – and so much awesome. Everyone should have a pair of Dr Martens because not only do they look freaking SWEET (loving the juxtaposition of clompy, blokey shape and dainty feminine floral print) but they will literally last you a lifetime ’cause they’re so well made. They’re also incredibly comfortable – but only after you’ve got through the painful breaking in stage. Wear them around the house as much as possible before you take them on their maiden voyage otherwise you will want to cut your feet off within 20 minutes. Cloggs have a great selection of DMs so you’re bound to find a pair you love. So, there you have it. The only four pairs of shoes I own that ever get worn. One of the many, many reasons I will never be a fashion blogger. DON’T JUDGE ME. i’m exactly the same as you, my collection is very exhaustive. I’ve got a pair of Puma Suedes, a pair of Short Jocelyn Ugg Boots, some converse, some cheap flip flops and some walking boots, they are literally the 4 pairs which come out most often (and at the moment my uggs are getting cleaned so I’m even more restricted). I don’t like buying new shoes because I’m scared they’re going to hurt, I aren’t one of these that can walk round in shoes that are crippling me, why would I when I have a perfectly comfy pair! ?